Bracket Busted? Start fresh each round and compete for your chance to win a college basketball dream trip. Play Round-by-Round now. There are officially no perfect brackets left, and most people are lucky if their national champion hasn't lost yet. Yes, it's been a wild NCAA Tournament so far. There's no better time to check in with our experts to see how they're doing. 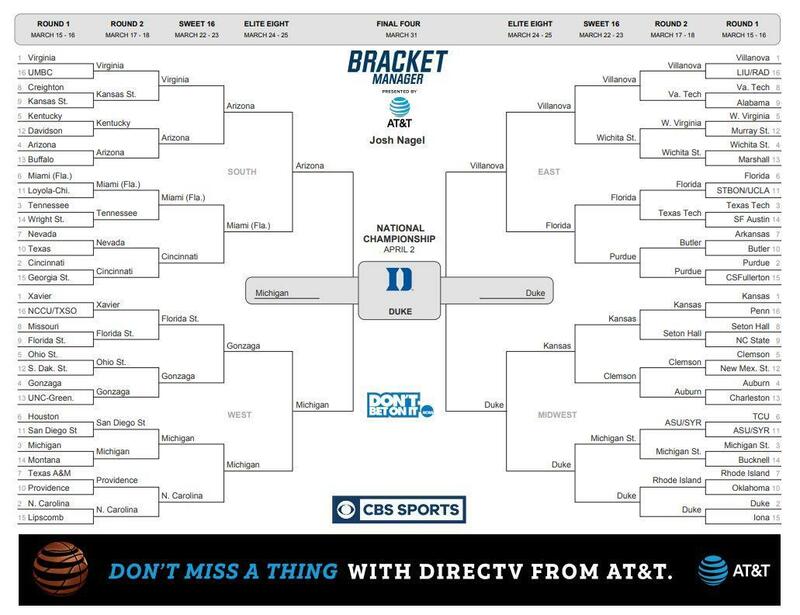 And if you've got a better bracket so far than any of them, please feel free to use this post to guide you on which of them you might want to blast on Twitter and Facebook. They'll, of course, appreciate props if you like any of their picks. Duke was my preseason No. 1 because the Blue Devils have the nation's most talented roster and the GOAT of college basketball coaching on the sideline. None of that has changed. And though the Blue Devils certainly had their questionable moments this season, the truth is that they're now third in offensive efficiency, seventh in defensive efficiency and very much capable of winning six games in this NCAA Tournament. In fact, that's what I'm predicting. So put me down for this: Mike Krzyzewski will secure his sixth national championship on the first Monday in April. And Marvin Bagley will be the Final Four's Most Outstanding Player. I originally had Virginia. I love that team's roster and its coaching. But De'Andre Hunter's wrist injury, which will keep him out for the entire tournament, is probably going to be too much to overcome. He's so valuable defensively, and physically, that I think it will have impact on both sides of the bracket. So I've got Arizona taking out Virginia in the Sweet 16 now. Tony Bennett's probably going to make me look dumb, but I'm not the first and won't be the last. So with that in mind, I'm putting Arizona into the Final Four, which means I need a new national champion. Purdue is the pick. The Boilermakers have the No. 2 team in offensive efficiency. They have small guard, big wings, huge big men and play both ends of the floor well. 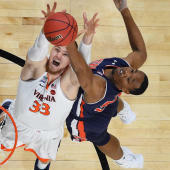 Were you aware they work the shot clock on the defensive end longer than Virginia? This is a top-five team in college basketball. It's the best 3-point shooting team in the tournament. The Boilermakers will flourish from deep. Carsen Edwards will be Final Four MOP. First NCAA Tournament title in school history. The Wildcats were my title pick in the preseason. They're still my title pick. This feels like the perfect Jay Wright roster, with a point guard in Jalen Brunson who has a mind-meld with his coach and a wing in Mikal Bridges who is the closest thing college basketball has to Paul George. The team fits together perfectly and can really shoot the 3. If there is one thing we learned during this college basketball season is that there is no such thing as a sure thing. That said, I cannot bring myself to bet against the team that has the best talent and the best coach. Duke's defense has gotten better since the switch to a zone, and they have more weapons on offense than anyone. They still have the occasional freshman moment, sometimes by the team's senior, but when they are on, they look unstoppable. I like Sparty because of their experience and overall talent. Miles Bridges and Jaren Jackson are future NBA stars, and of course, Tom Izzo plays a big factor for why I like them here. They've played their best ball of late, too, which is why I think they can win it all. I'm less confident in other top-seeded teams. Yes, No. 1 seeds Kansas, Villanova, Virginia and Xavier will be favored to come out on top of their regions. But I think the matchups dictate that only one -- Villanova -- actually makes it to San Antonio for the Final Four. Villanova over Arizona: Defense doesn't win championships when it comes to the NCAA Tournament. The last team standing is almost always one of the best in the country in terms of offensive efficiency and Villanova has shown handfuls of ways to get the ball in the bucket. Jalen Brunson has been the National Player of the Year-type player that can power a deep tournament run, but mark me down in predicting Mikal Bridges as the game-changer and Final Four Most Outstanding Player for Jay Wright's second title team in three years. A disclaimer: The current players are innocent. They were all so classy at last year's Final Four. I loved profiling Joel Berry II and his MOP performance. Berry is back along with a group of experienced starters who are steeled for this moment playing a typically tough ACC schedule. I've known Roy Williams for years. He's a hall of famer 10 times over. But it's worth mentioning the foundation for the North Carolina's 2017 national championship was built over decades of academic fraud. The NCAA infractions committee thought otherwise. That doesn't mean it was right. Again, the current players had nothing to do with it. But how incredibly ironic would it be that six months after school received a Get Out of Jail Free card from the infractions committee, the Tar Heels go back-to-back? I think they can flying absolutely under the radar. The Heels have excellent guard play and -- always under Roy -- like to push the ball. UNC shares the ball (fifth nationally in assists) and hits the boards (No. 1 in rebound margin). In a season when everybody is talking Virginia in the ACC and FBI off the court, don't forget a blueblood's ability to win it all. Check the West bracket. It opens up nicely for the Tar Heels to reach a third straight Final Four and win consecutive national championships. I think Duke has the best starting five in the country, and the most balance since it last won the title in 2015. Duke appears to have a manageable road, since Kansas has overachieved but I don't see the Jayhawks as a real title contender. Of course Duke has to avoid foul trouble, fatigue and serious injuries. But Blue Devils appear to be the toughest out in a single-elimination format, and I'd like their chances against any team from the opposing brackets in the final. The last two years, SportsLine's computer simulation correctly predicted nine out of 12 double-digit NCAA Tournament upsets in the first round with their computer algorithm. This year they have plenty of upsets again, like one region where you need to pick the 11, 12, AND 13 seeds, and another region with a 4-seed in the Final Four. 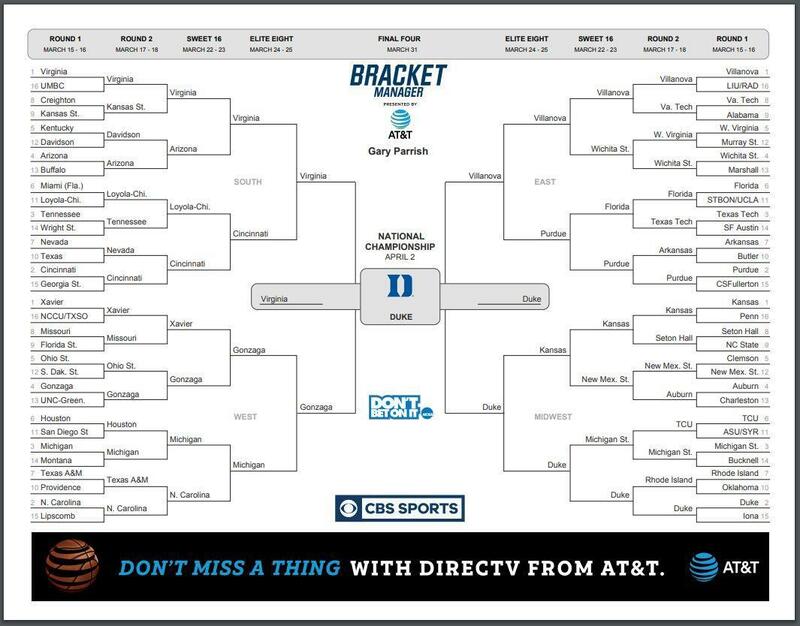 Click here to see SportsLine's Optimized NCAA Tournament bracket.